Very similar growth habit to it's parent, but with large white flowers with just a tinge of pink, flowers have an excellent fragrance. A long flowering rose that deserves a place in the garden. 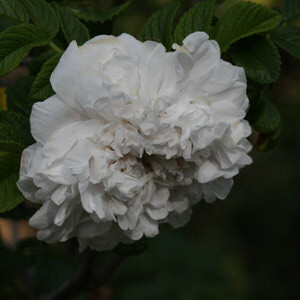 Did you know that rugosa roses are admired for being disease resistant, including black spot, hardy in both cold and hot conditions, and drought tolerant, they also cope with a little more shade than many others. Plant in a sunny position, a minimum of 6 hours sun a day is recommended for roses, in a well drained soil and provide support for young plants. Before planting dig in some well rotted compost and decomposed animal manure, preferably 2-3 weeks before planting, this allows any 'heat' in the manure or compost to dissipate. Water in well well after planting and mulch to provide a cool root run. Prune in early spring cutting back any old dead, diseased or damaged wood to start with. Remove canes that cross and open up the centre to allow good air movement, this helps reduce disease. Remaining canes can be cut back by 1/2 to an outward facing bud.